This painting is a tribute to Leonardo da Vinci, whose Birthday it is today. This is my interpretation of the Last Supper. Jesus washing the feet of the disciples. Jesus’ act was both literal and symbolic. First, the washing was an act of love and care. Taking each foot into His hands, He carefully removed the dirt and the grime accumulated from walking across dusty lands with only sandals for protection from the elements. As He bathed each foot, He brought cleanliness and comfort to those who served Him. His actions also hold more than physical meaning. 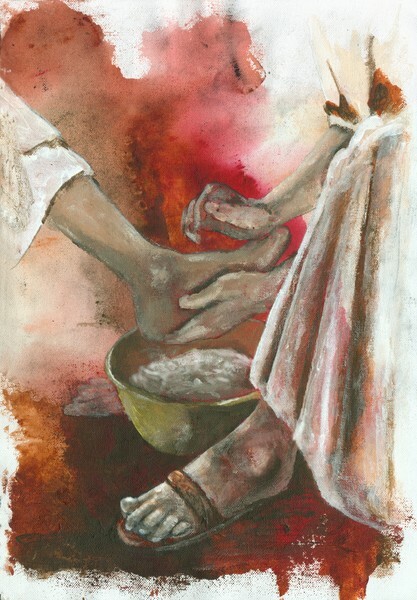 When he washed the Apostles’ feet, He became their servant. As he poured the water over their skin, He purified them, cleansing His disciples of their sins. As He used the towel around His waist to dry their feet, He wiped away any wrongdoings, giving them a new beginning. 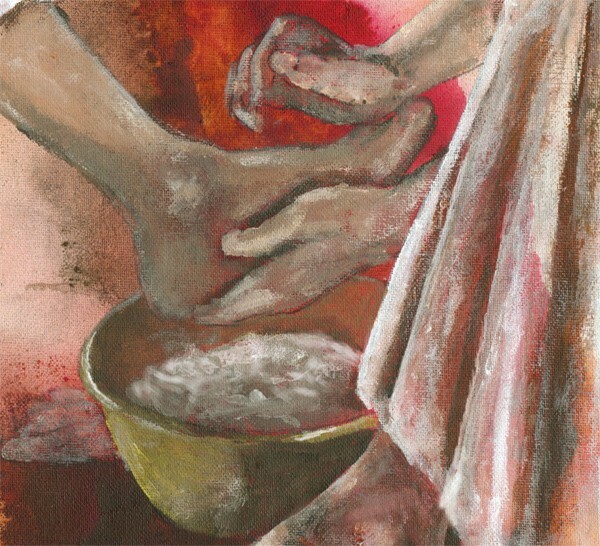 When Jesus asked His followers to “wash one another’s feet,” He did not mean this in only just a literal sense. He asked His disciples to serve those most in need; to treat everyone as equals, and to bring the Good News to every person without discrimination. Artist Reply: Thank you so much for your beautiful words, Angel! Beautiful Work!You Have a Really Fine Art Style,With a Set of Brushes,Anneke! Artist Reply: Thanks a lot, Tim! Artist Reply: I'm glad you like it, thank you!! amazing artwork and tribute,excellent painting. Artist Reply: I'm glad you like it! Thank you very much, Yves!